In his next letter written three days after the surrender of Fort Macon, Oliver Case gives an account of his view of the culminating action during the siege of the Confederate fort at the tip of the Bogue Banks. Brigadier General John G. Parke, the brigade commander placed in command of the siege efforts by General Burnside, had assembled his guns for the attack including three artillery batteries of eleven total guns, both mortars and 30-pound rifled guns. The soldiers of the 8th CVI had labored for weeks preparing the artillery and infantry positions to lay siege to the fort. The regiment has been hard at work ever since we arrived here, throwing up entrenchments to protect the artillery and infantry. On the 24th of April, with the preparations for a bombardment completed, General Parke called for the Confederate garrison of Fort Macon to surrender. 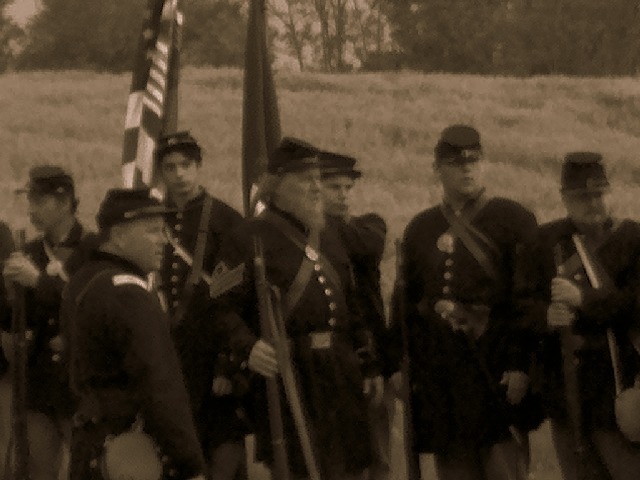 General Burnside had arrived the previous day and met under a flag of truce with the commander of the fort to no avail. The surrender of the fort was now demanded, and met a defiant refusal. Burnside gave the order to commence with the siege and Parke responded to the defiant Rebels by turning up the pressure. Our riflemen pushed up so close as to pick off the rebel gunners. The bombardment of Fort Macon began at 5:00 am on the morning of April 25th with Parke’s eleven guns from Bogue Banks and some assistance from batteries afloat. On the morning of the 25th, fire was opened on the fort from the shore batteries and the three steamers moving in a circle. The latter drew off after an hour’s fighting; and the siege batteries increased in energy, shaking the sandy beach, and knocking gun after gun from the fort’s parapet. The work was completed Thursday night and the bombardment commenced early the next morning and continued without intermission until four in the P.M., our regiment meanwhile lying behind the breastworks while a perfect rain of shot and shell came upon all sides of them, many times caving the banks upon them so it was necessary to dig one another out with shovels. Several of our men were hit by balls rolling into the trench upon them, but none were wounded. The artillery lost one killed and two wounded. The Eighth was alone in the rifle-pits, between the thundering cannon, shooting the rebel gunners and infantry whenever a head was visible. 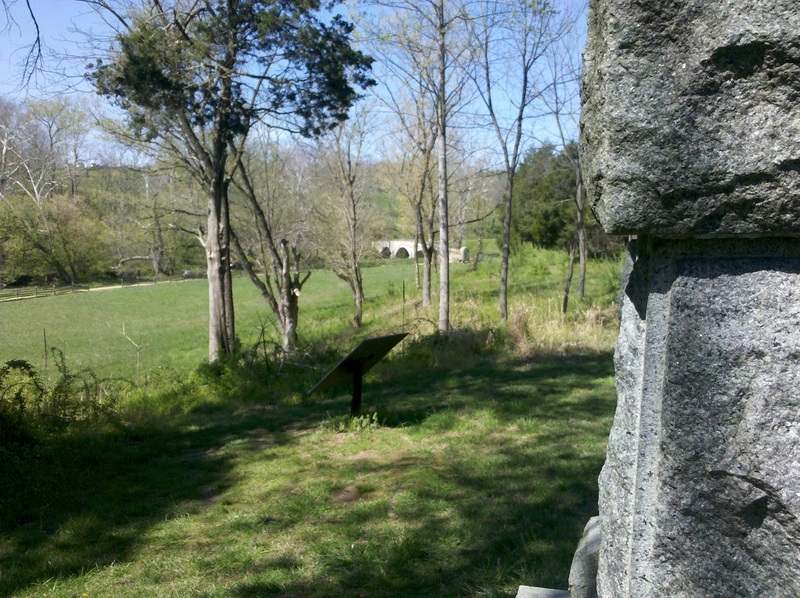 The fort was commanded on this day by 27-year old Confederate Colonel Moses J. White. White, a native of Mississippi, held an impressive record at the U.S. Military Academy in the Class of 1858 graduating second. Originally assigned to the western theater at the beginning of the war, he was given command of Fort Macon on October 5, 1861. During the siege, White was struggling with health problems that had first appeared during his time at West Point. However, he continued to encourage his officers and soldiers during the bombardment until he was completely exhausted. By the afternoon of the 25th, it was evident that the fort and its garrison could not withstand much more of the devastating fire from the Union guns. After meeting with his commanders, White ordered the flag of surrender to be raised. The Union forces entered the fort and raised the national colors igniting a controversy between two of the regiments. …early the next day the “Stars and Stripes” were run up by the 4th R.I. Regiment. The 8th Conn. were not very well suited to do all the work and have the 4th R.I. hoist their flag, but that is all right; it is “Uncle Sam”, anyhow. Croffut and Morris identify the Rhode Island regiment as the 5th and give additional details on the honor bestowed on them in lieu of the 8th. …the 5th Rhode-Island; and to this fragment of a regiment the rebel flag was given as a trophy next morning, when the formal surrender was made, and the regiment took possession of the fort. The Eighth considered itself again defrauded of its just rights; and the Tribune’s narrative said, “But for the accident that the 5th Rhode-Island had relieved the Eighth Connecticut the previous evening, the captured flag would have gone to grace the legislative halls at Hartford.” Gen. Parke justifies giving the preference to the Rhode-Island regiment by the fact that the Eighth Connecticut Volunteers had no field-officer present to receive the surrender. In a happier ending to the story for the Confederate officers and soldiers of Fort Macon, Oliver relates that many of them, after their parole, were reunited with their family members. The prisoners were discharged on parole, much to their gratification and some of our boy’s displeasure. Sightseers say that they had a great time over in Beaufort Saturday when the garrison was set free. Children looking for their parents, wives for their husbands, fathers for their children and when they were recognized in the crowd such a hugging and kissing as was not often seen was carried on. What a great day at Antietam! Congrats to the NPS and the folks from Connecticut who put so much work into making Connecticut Day at Antietam 2012 an outstanding event. It provided a wonderful opportunity to meet some interesting folks who love talking about the CW and Antietam. A special hap tip to John Banks for his time and gracious introductions to many of the folks. I hope we now have some new friends here at Oliver Cromwell Case. On a recent trip to the Rohrbach Bridge (Burnside) area of the Antietam Battlefield, I couldn’t help but think of the sacrifice (albeit needless) of the men of the 11th Connecticut. In particular, I recalled the pronounced valor of Captain John D. Griswold who led a group of the Connecticut soldiers as skirmishers only to be mortally wounded as he crossed the creek. John Banks has an excellent, detailed account of his heroism. 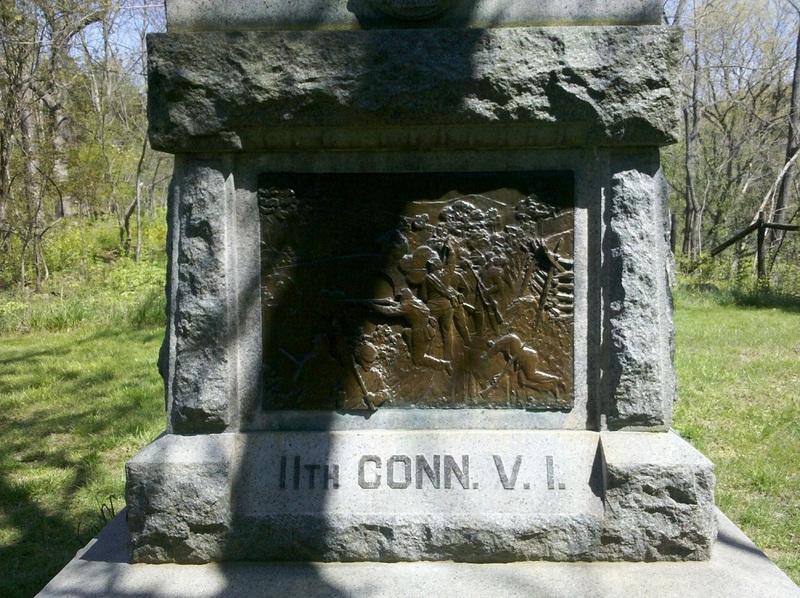 The men of the 8th Connecticut had been the first of Harland’s Brigade to experience loss as just after sunrise as the Confederates sent “a solid 12-pound ball…diagonally through the Eighth, killing three men, and frightfully wounding four…” Now their sister unit, the 11th CVI, was devastated in the failed attempt to secure a crossing at the bridge. In late March 1862, the commanding officer of the 8th CVI, Colonel Edward Harland, was sick and bed-ridden with typhoid fever as his regiment was divided into three parts. Two companies were sent to occupy Beaufort and a few of the other companies were sent to secure Morehead City. The remaining companies including Company A crossed over from Carolina City to the Bogue Banks to begin movement toward Fort Macon located on the tip of the banks. Oliver Case had been on picket duty seven miles away from camp near Carolina City when his company departed. As Private Case caught up to his fellow soldiers over on the Bogue Banks, there was much work to be done in preparation to lay siege to Fort Macon and its Confederate garrison. On April 12th, the 8th CVI being commanded by Major Hiram Appelman in the absence of Colonel Harland began their push toward the fort. The Military and Civil History of Connecticut: The War of 1861-1865, 1868 by W.A. Croffut and John M. Morris, 1868. The irony of those words coming from Oliver Case exactly five months before he would lose his life on the fields outside Sharpsburg. Commenting again to his sister Abbie, Oliver expresses the surprise he felt before marching into his first combat experience at New Bern, N.C. I felt very different upon the battle than I expected. There is not the dread of death that one naturally expects. What did he expect? Fear? Cowardly? Anger? In presentments of death I have no confidence. While I have seen men go into battle predicting truthfully their own death, yet I believe it is the belief of nine out of ten who go into battle that this is their last. I have never gone into battle that I did not expect to be killed. I have seen those who had no thought of death coming to them killed outright. 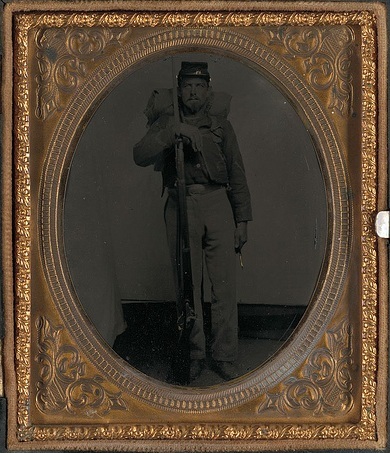 Thus Corporal George Horton, wounded at South Mountain, wrapped his handkerchief around his wounded arm and carried the colors of our regiment to Antietam. Being asked why he did not make the best of it and go to the hospital, that he was liable to be killed, he answered, “The bullet has not been moulded to kill me.” Alas! he was killed the next day. This line of discussion by Oliver began as a result of a rumor sent back home by his “friend” Philo Matson who we first met in the letter of 16 March 1862. I do not see what object P.A. Matson can have in representing me sick and “will probably never be able to see Conn. again.” He knows that since I left Annapolis, with the bare exception of a short time upon the “Chasseur”, I have been perfectly healthy. I do not think that there is one in the company but what has had sick spells caused by exposure. I may not live to get home, but I think I stand as good a chance as anyone in the company, P.A. Matson to the contrary notwithstanding. On the 20th of March 1862, the two regiments plus the 5th Rhode Island continued their march toward Morehead and Beaufort while two companies of soldiers were left behind to guard the captured Confederate barracks. According to Oliver’s letter of 6 April, the group reached Carolina City on the 22nd and received a temporary respite from marching as they went into camp operations. …we arrived at Carolina City where we have remained in some shanties of boards which we have picked from some old dilapidated dwelling. The sesech burnt the principal buildings before they left. There has been a splendid vessel burnt near the fort since we have been here to prevent its falling into our hands. Once again, Oliver found himself on picket duty stationed about seven miles from the main camp but enjoying the duty “very much.” Food was readily available to the soldiers who made good use of their issued food and “traded off our hardtack and salt horse for sweet potatoes and hoecake and had a fine mess of greens.” Obviously, relations with the local populace were good enough to facilitate this barter system although the Carolina City residents may have received the worst of the deal. “Salt horse” was a demeaning nickname used by soldiers for the salted meat provided by contractors in large barrels to Army units. The meat was often spoiled as alluded to in one of Oliver’s earlier letters. When Oliver returned from his remote picket duty, he found that his company was gone and the rest of the regiment had been moved to multiple locations in anticipation of future operations. When I got back, Co. A was on the other side of the sound, except a few sick ones who were left behind, and as our tents had come to pitch and floor them and get into camp once more. We expect the Co. back today but they may not be in, in several days. Our regiment is pretty well split up; two companies at Morehead, one at Beaufort, and ours over on the Island. The force consisted of the Eighth Connecticut and the 4th and 5th Rhode-Island. The trains were much delayed : there was little food, and no tents or cooking utensils. The weather became stormy, and the men dug holes in the ground, and sheltered them with boards; and here for a dreary week they lived, catching a few fish and oysters when they could. Here Col. Harland was prostrated with typhoid-fever. Two companies of the Eighth were sent over to occupy Beaufort, and others to Morehead City. Opposite was Fort Macon, on the extreme upper point of Bogue Banks, a low, sandy island, or spit, half a mile wide, stretching twenty miles south-west along the coast. Inside this island was Bogue Sound, three miles wide, with shallow water, only three or four feet deep. 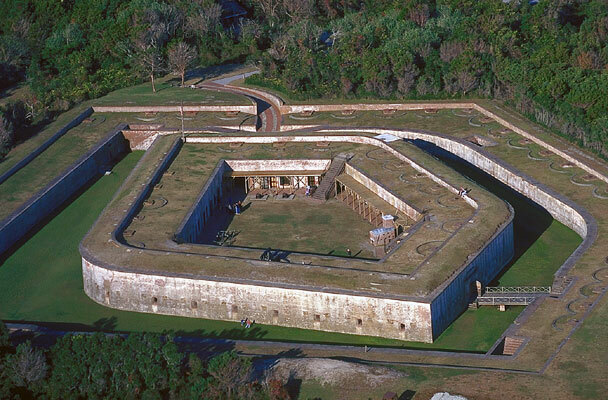 Fort Macon is situated upon the extreme west of the island and completely hemmed in by our forces, both by land and by water. Our gunboats will make an attack soon, assisted by the artillery, if they do not surrender. It seems a pity that they should attempt to hold it when they themselves know they cannot and it will probably cost them a great many lives. The garrison consists of 300 men which cannot hold it a great while against our mortars. Oliver closed his letter of 6 April in his normal manner asking about the news from home including the news of the burning of his Uncle J.A. Tuller’s house and the deaths of both William Mather and his wife. He is also very happy to have recently received a letter from his father.